Tree Surgeons in Prestwich that are affordable, friendly & reliable. We are tree surgeons carrying out work in the Prestwich area of Manchester. 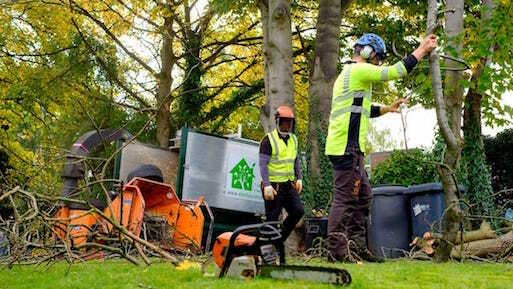 Elm House Tree Services is a professional outfit that have a combined 30 years experience and pride ourselves in being 100% professional and deliver work to a high standard. Our company has full insurance for your peace of mind and we endeavour to keep ourselves competitively priced against other tree surgeons in your area. This means that when we quote you can be sure that we have put our best quote forward first. When you contact us we will get back in touch with you ASAP as we understand that if you are thinking about it now, you probably want it fixed relatively shortly. We are City & Guilds NPTC qualified. A plan is always in place & we show up to do the job. We have the skills to get the job done fast to a high quality. We leave your site looking great & tidy to boot. We recycle all the material that we chop down. We keep our prices competitive. We keep it simple & all above board. We come to do a job, but are nice guys also!